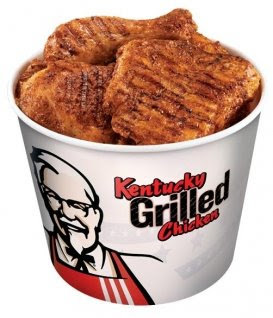 Get two pieces of grilled chicken, 2 sides & a biscuit at KFC, thanks to Oprah! Click here to download the pdf coupon. There isn’t a print limit (hint, hint). One coupon per person during offer period. The site states the coupon will be pulled 8:00 pm Pacific on Wednesday, May 6. Now I’m wondering if the coupons I printed will be valied? When I printed mine it had a different system up to print them and it let me choose to print more than 1 at a time. Now it’s completely different and it won’t let me print anything. It doesn’t say I’ve reached my limit, it goes to print them, acts like it does but nothing. I also read somewhere else that each coupon as a different bar code. Mine do not but KFC doesn’t have a scanner to actually scan the coupon in, does it? It allowed me to print 3 coupons, but that is fine by me! Thank you for posting this. Thank you! Hmmm….I printed 6 (2 for my family and 4 for my friend who won’t get a chance to print it off before tonight). Maybe because I did it two different times? Not on purpose, but I printed mine off first. Then went back to print my friend’s off after I thought about it. It does state that you are only to print 4 and then it talks about coupon fraud.